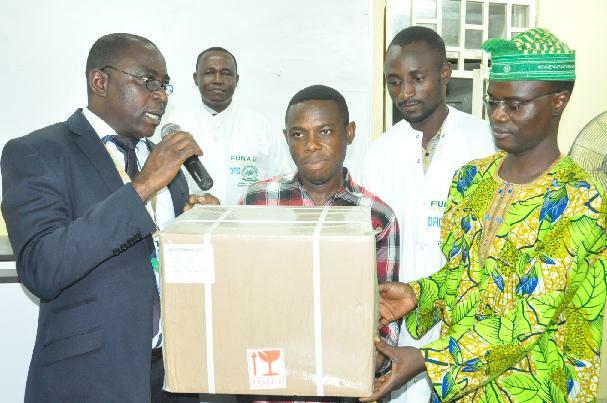 The Agricultural Research Council of Nigeria (ARCN), under the competitive Agricultural Research Grant Scheme (CARGS) funded Tomato Transformation Project in the University, has fulfilled its part of a research agreement, by presenting a Polymerase Chain Reaction (PCR) machine to its collaborator in the project; the Biotechnology Advanced Laboratory, Abuja. Speaking at the presentation ceremony, the Principal Investigator, Dr. Akinola Popoola, disclosed that at the inception of the project, an agreement was reached that a PCR machine would be handed over to its collaborator (BAL).to him, the major objectives of the project include developing the protocols for efficient regeneration of the variants of farmers-preferred local varieties of tomato. Dr. Popoola stated that by the development, the first three objectives of the initiative had been completed with the assistance of Italian collaborators.appreciated ARCN for the level of work done under the CARGS-funded Tomato Transformation Project and solicited for the support of Management in bringing the project to a successful conclusion. The Vice-Chancellor, Professor Olusola Oyewole, who was represented at the occasion by the Dean, College of Plant Science and Crop Production (COLPLANT), Professor ‘Goke Bodunde, commended BAL for the existing relationship, as he expressed the desire of the University to maintain collaborative relationship with the laboratory. Reiterating the University’s commitment to fulfilling all agreements it entered into, the Director of Grants Management, Dr. Kolawole Adebayo, also said FUNAAB was engaging in a wide range of collaborative research activities without compromising accountability and transparency, as he encouraged the Principal Investigator to liaise with the Directorate of Grant Management for the necessary support. “In that budget, our University annually has its own research grants other than what we get from outside and this year; the University has increased its budget for research, from 12 to 20 million Naira”. The representative of BAL, Mr. Charles Osuji, appreciated the University for fulfilling its side of the agreement, while assuring that on the part of BAL, it would ensure that the existing formal agreement between the two organisations was sustained.